Every time I see hot air balloons, I'm reminded of the annual balloon festival in Albuquerque, New Mexico. What a spectacular sight! Although I have yet to actually ride in a hot air balloon, it is on my bucket list. This was one of the cards we made in today's stamp club, where the Lift Me Up bundle was the featured product. It will be available starting January 4th, and you can save 10% by buying the stamp set and dies together. The DSP used is called Carried Away, and will be a free SAB item starting in January, too. Die-cut balloons: Scrap of Whisper White 2-1/2" x 4-1/4"
Image/greeting panel: Whisper White 2-5/8" x 4-1/8"
Mats: Copper foil and Night of Navy 2-3/4" x 4-1/4"
DSP: Carried Away (2017 SAB) 4" x 5-1/4"
Card base: Night of Navy 5-1/2" x 8-1/2" scored & folded at 4-1/4"
Stamp the greeting in Night of Navy on the lower right of image/greeting panel. Stamp clouds randomly along top half of panel. 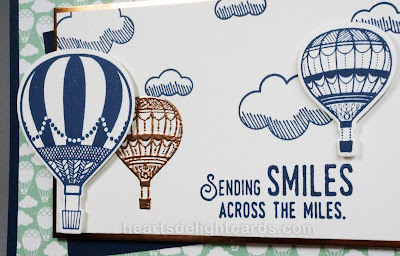 Stamp the two balloons on the Whisper White scrap and die cut them. Rub embossing buddy on cardstock to the left of the greeting. 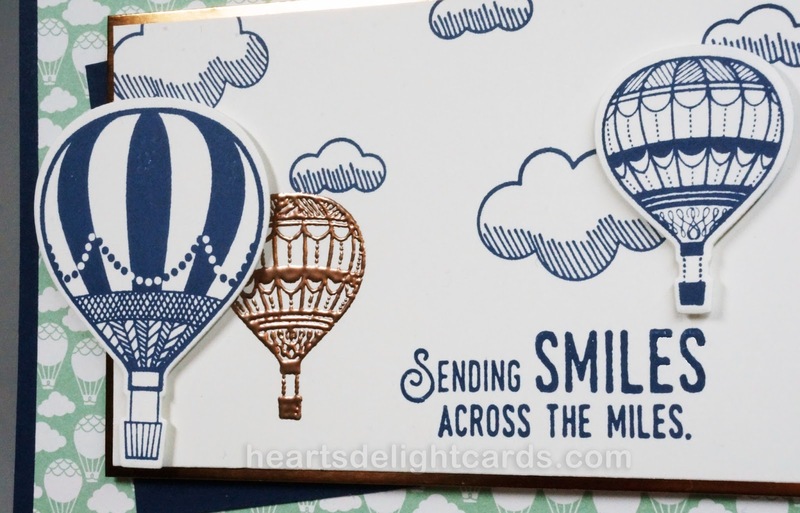 Clean smaller balloon stamp and stamp using VersaMark ink. Cover with embossing powder, tap off excess, and heat with heat tool until melted. Adhere DSP to card base. Adhere Night of Navy cardstock at an angle over DSP. Adhere stamped panel to copper foil. Attach to card with dimensionals. 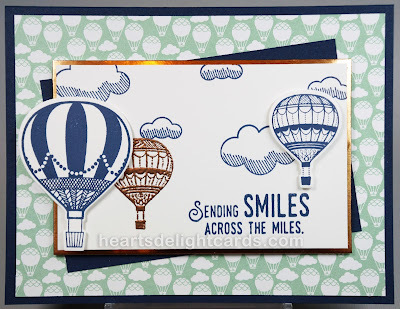 Add die cut balloons with dimensionals.